Let’s play a game…what does coffee, birthday and recording artists have in common? Cake is a glorious thing isn’t it? (The food and the band)…I myself have been known to indulge in delightful decadence such as a moist cake covered in rich, blissful buttercream frosting. Unfortunately, I have yet to master the baking level to achieve such an indulgence…that’s what friends are for…right?! 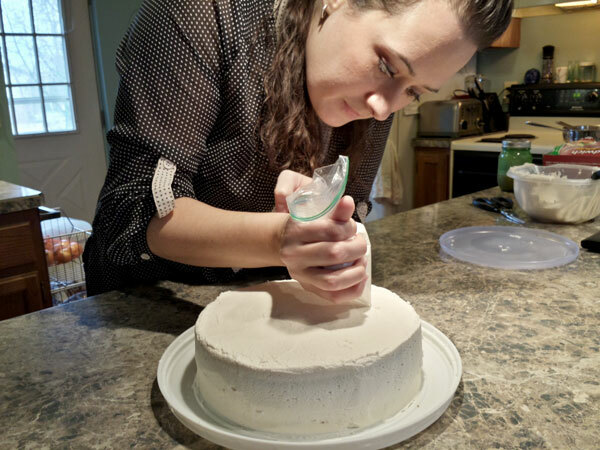 Meet my good friend Cassie- Owner and operator of Cassie’s Creations…cake extraordinaire…or as I fondly like to refer to as my “Kindred Spirit”. I’ve enjoyed many delights from her kitchen, but her cakes are the delectable treat that haunt my hangry daydreams (in a good way). She runs her own business creating delicious cakes for various events, and believe me folks, she doesn’t disappoint! JJ: How long have you been baking cakes? C: I have been baking cakes for about 6 years now. I took a couple of classes at Hobby Lobby for the basics on how to decorate cakes. C: My Grandma, Kathy, is my inspiration. She was an amazing cook and baker. 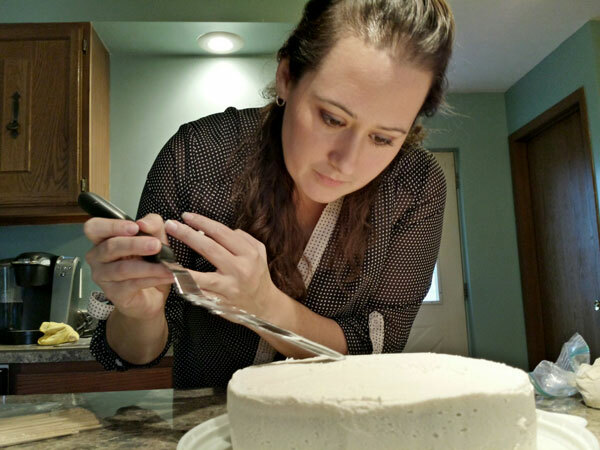 She used to make wedding cakes for years and years. I can remember growing up, sitting at her high table, with a frosting bag in my hand and one in hers while she decorated her cakes. I now bake my cakes and make my frosting on her Kitchen-Aid mixer. JJ: What is the BEST cake you’ve ever made? C: I would say my BEST cake is my Caramel Apple Cake. I wanted to start making some seasonal cakes and I had to make a baby shower cake for a momma of three and she wanted Caramel Apple. Who am I to deny a pregnant women her Caramel Apple? JJ: What has been your greatest learning experience in the kitchen? C: My greatest learning experience…that is a very hard question. I would say any mistake, that I make, is a learning experience. Anytime you make a “mistake” in the kitchen, use it to your advantage. Every wedding cake I have made, there have been mistakes. 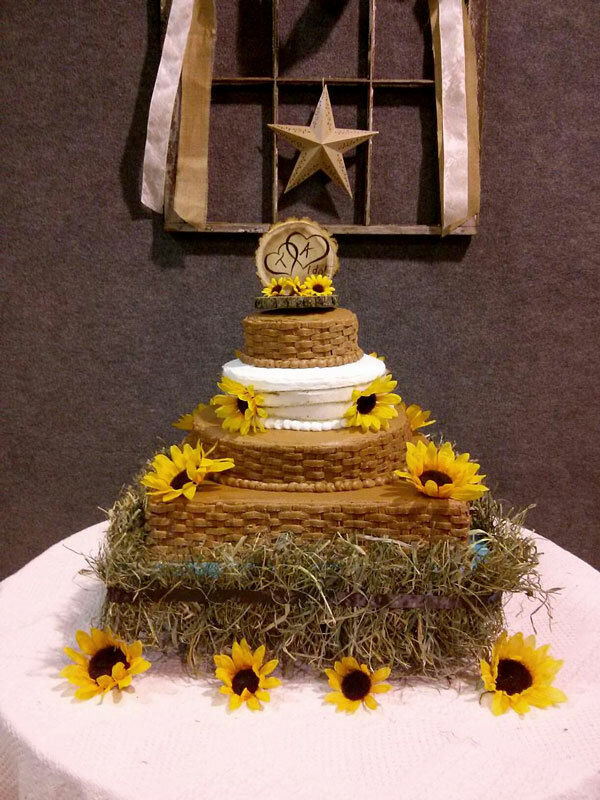 You just cover it up with more icing or it makes the perfect spot for another flower! JJ: Can you share any secrets or advice for making a moist, delicious cake? C: Freeze it! Always make your cake ahead of time, cool it, wrap it in plastic wrap, then wrap it in aluminum foil and put it into your freezer. When it is time to frost your cake, take it out and let it thaw for about 20-30 minutes to be able to take off wrappings. Once you have let it sit, start stacking with frosting and/or filling. 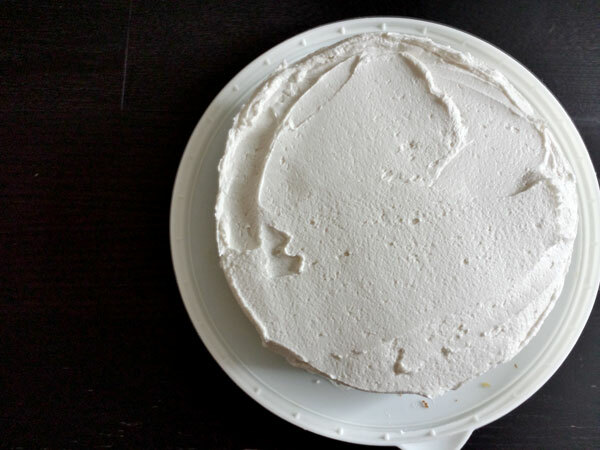 Put frosting on the sides, but allow the cake to finish defrosting. 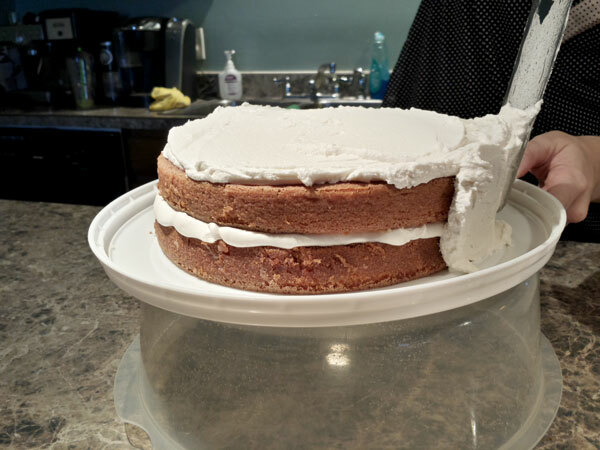 When you feel the top and it is no longer frozen solid, you can then put icing on the top. If you do not let it defrost more, you will have puddles of water on top of your frosting. JJ: How do you set the “baking” mood in your kitchen? It all depends on what time of the year. I need to have sound, whether that be I watch a movie on my Kindle or music is playing in the background. Halloween and on, Christmas music all the way! Scrooges, say what you want, but it is magical! JJ: What’s the one item in your kitchen you can’t live without? C: My mixer! That is my grandma in the kitchen with me along with all of the memories we shared in her kitchen. Also, who wants to hand whip everything? I certainly don’t! C: Fondant is a must in the winter and I prefer this for wedding cakes. I think that it makes a cleaner looking cake. Buttercream is a no-no for weddings where it is going to be warm. No one wants a cakes that is melting all over their cake table. For eating, I much prefer the buttercream, but I do make a good marshmallow fondant. JJ: What would be your PERFECT last meal? JJ: What is your favorite cake recipe? This month, it is a toss-up between the Apple Caramel Cake and Pumpkin Roll. Both are to die for! I love sharing my kitchen with Cassie. We laughed, we cried, we drank…coffee (we’re responsible adults) and I am not ashamed to say that I stuffed my face with a “Janie-Jean” sized piece of her delicious Caramel Apple Cake! 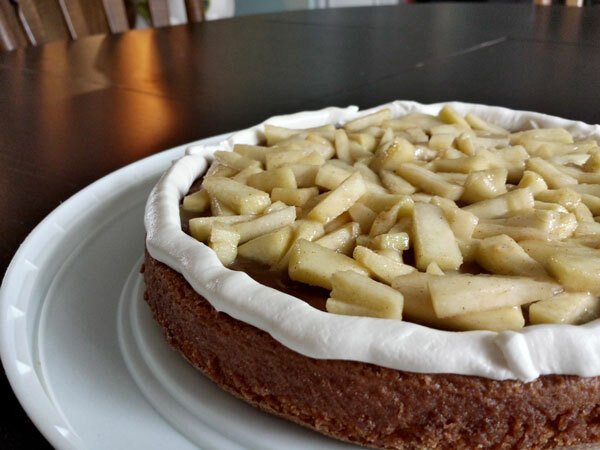 The recipe is below…but let me give you a little recap: sautéed apple pieces are drizzled with a delicious caramel sauce and sandwiched between two rounds of sour cream cake, coated with an even richer wispy butter cream frosting. Lucky for me I got to keep the leftovers to snack on this week…while my taste buds were shouting “I’m so excited!”… my thighs are singing a different tune! 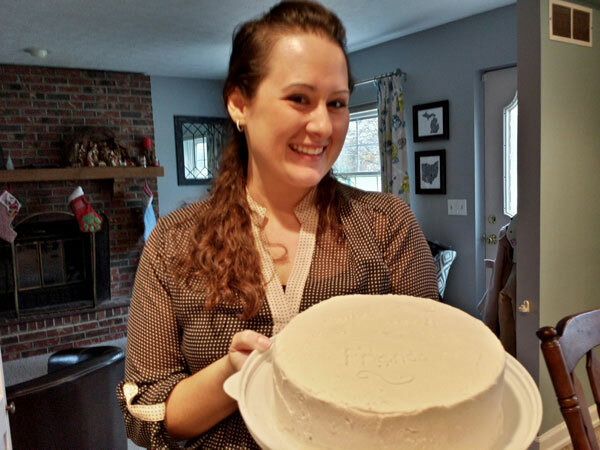 Nevertheless, be sure to check out her unforgettable recipes below, and if you or someone you know is in the market for a celebratory cake do yourself a favor and contact my girl Cassie. Comment below if you’re interested and I will hook you up! 2-5 Tbsp of water--this will depend on how much caramel you added and how spreadable you want the frosting. Pinch of salt---this is a must! Preheat the oven to 350 degrees. Grease and flour two 9 inch pans so they are ready when you are. Mix sour cream, baking soda, salt and eggs until combined. Add vanilla and sugar to egg mixture. Mix until combined. In a small bowl, mix melted butter with 1 cup water. Turn mixer on low speed and alternate adding the water and butter with the 2 cups flour. Mix until just combined, do not over mix! Pour batter into the prepped cake pans and bake in the oven for about 25 minutes. Be sure to insert a toothpick into the center of each cake to check for doneness. If the toothpick comes out clean the cakes are completely baked. Mix the brown sugar, half and half, butter and salt in a saucepan over medium-low heat. Cook while whisking gently for 5-7 minutes until it gets thicker. Add the vanilla and cook another minute to thicken further. Turn of the heat, cool slightly and pour the sauce into a jar. Dice the green apple to equal sized pieces. In a large skillet over medium heat saute the apples with the cinnamon and butter stirring occasionally until crisp tender. Finish the apples by drizzling the caramel sauce over the apple mixture. Set aside to cool. Cream together the Crisco and powdered sugar until completely combined. Add in the vanilla, caramel sauce, water and salt and mix until it is the spreadable consistency you desire. Place one of the completely cooled cake rounds on an even surface (cake pedestal or cake plate). 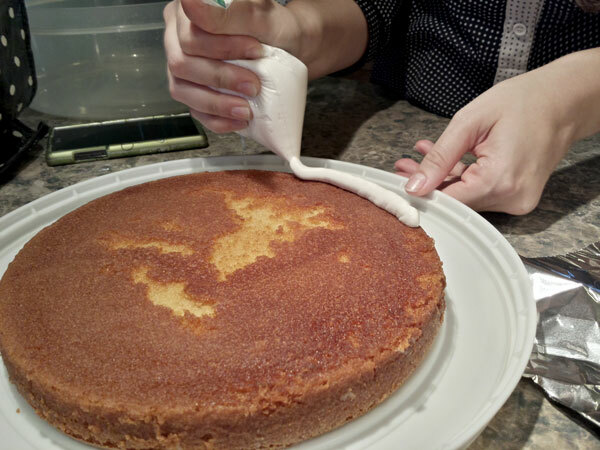 Using a piping bag, pipe the butter cream along the outer edge of the cake top. This will act as a barrier preventing our filling from oozing out the sides. 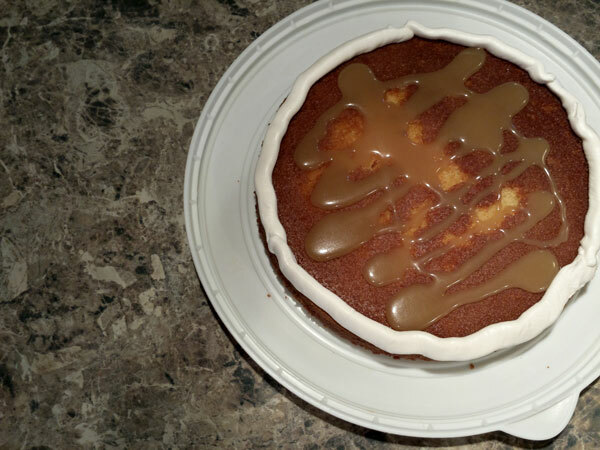 Drizzle the caramel sauce across the surface and within the outline of the caramel butter cream. Spread the caramel so that it covers the surface of the cake evenly. Pour the sautéed apples over the smooth caramel sauce so that it sits as one even layer over the surface of the cake. Drizzle with more caramel sauce. Place the second cake round so that it covers the filling and is evenly aligned with the bottom cake layer. Using the remaining buttercream , frost the cake entirely. You may have leftover butter cream which you could use to decorate OR set aside for a midnight snack for later…YOU DECIDE! Slice and enjoy one of the most decadent, moist cakes you’ll ever taste THIS SIDE of the Ohio River! Thanks Cassie!